A deep and alarming deficiency in emotional intelligence is seen as one of the causes of the current world disorder, which also appears in the child’s world. Signs of this crisis have become evident in the increasing problems of attention deficit, hyperactivity, and depression in children, violence among children and adolescents, and drug use starting in childhood. Faced with a range of explicitly poor results, we see the need for major changes in education, since schools and homes have not been able to wisely solve the challenge of developing g an “emotional education”. In other words, education for guiding humanity towards a goal of life, taking emotional development into account, is lacking. Prabhat Rainjan Sarkar (1921 – 1990), Indian philosopher and spiritual master, used to say that the daily nourishment of our Spiritual Being is as important as the nourishment of our physical body. When we focus only on education in the physical and intellectual levels, we consequently limit our understanding of life and the multiplicity of our relationships. Understanding the unlimited, spiritual thirst of children, in particular, we increase the possibility of their having better personal balance and a higher purpose in life.Thus, for children to have healthy and appropriate emotional development at school and, consequently, in social environments, positive interpersonal relationships should be established, including aspects such as acceptance and support, learning to collaborate and to live collectively in society, and to enjoy oneself and others. Based on this, education will be able to create in each individual child a feeling of love and unity with all beings  . In this context, an important alternative today is Neohumanistic Education. Based on the philosophy of Neohumanism developed by Indian philosopher P. R. Sarkar, it is a balanced and harmonious synthesis which aims to help every child to develop his or her highest potential. Its basic principles are: to teach children to respect other people and themselves; to promote mental expansion; to develop the spirit of unity; to awaken universal love – a potential to love all forms of existence; to be based upon universal ethical concepts, like truth, love, simplicity and solidarity; and to emphasize the importance of relationship with nature . Circle of Love, being manly oriented to children in kindergarten, is a collective and playful activity that fits nicely in the Neohumanistic educational agenda. Integrating ancient wisdom with modern science, it offers a simple and effective program to build character, restore emotional balance, and strengthen emotional ties in order to help children to open their hearts. In a world threatened by destruction of all kinds, it is essential to achieve healthy living, mutual understanding, and universal peace. The Circle of Love program has been formulated by psychologist, anthropologist, and yogic nun, Dr. Susan Andrews. She was born in the United States, but now she lives in São Paulo, Brazil, where she conducts various social service projects including running an Educational Center “Espaço CreSer”. Circle of Love is also part of several kindergarten programs in Brazil and around the world . It consists of a series of songs that speak about love, compassion, respect, joy and God, a “God” who has many names: Mother Nature, Mother Earth, Lord, Supreme Being, etc. The Circle also incorporates creative movements, psychomotor exercises (yoga for kids), visualization and stories, all to encourage in the children a sense of unity and empathy with the world around them. In this wave of affection, alternating exciting moments with reflective ones, the children can feel their loving connection to the Universe, with each other and with nature – all together encompassing a Large Family . The epidemic that is spreading in our society is not only stress, but also the deep sense of loneliness, emphasizing the need for the power of love and empathy for the health and quality of life. We live in a small town in south of Brazil – Pontal do Parana – where there are a lot of problems with drugs, violence between children and adolescents and absent parents and dysfunctional families. Inspired by the love that exists inside the kids, worried about the existing education system and noticing that Yoga is the best and most complete solution for humanity, we decided to do a post-graduate study on Pedagogic Yoga. We chose the practices of ‘The Circle of Love’ as our research theme. For 3 months, we went every morning to the Public Early Childhood Education Center ‘Agua Viva’ to teach the Circle of Love curriculum to the children. The good results of the Circle of Love on the children’s behavior could already be noticed during the firsts days in all aspects evaluated. And this improvement was even better over time. Given these results, we could prove ‘scientifically’ the importance of affection and the encouragement of positive emotions in the school environment, making the ideals of the Circle of Love indispensable in early childhood education. The Circle of Love is an important educational tool for developing more humane, happier and healthier children with a feeling of unity and equality with all beings (Neo-humanism), consequently, creating a better world!”We decided to spread the idea around the world and sent an abstract about our experience to the International Conference ‘The Future of Education’ (http://www.pixel-online.net/edu_future/) that will take the place in Florence, Italy, on June 2011. Our paper was accepted by the conference organizers and they also invited us for an oral presentation! Now, we are working to raise funds to be able to present our findings at the Conference. Below is the paper we submitted. <andress.ap gmail.com>. The Circle of Love is an activity guided by the principles of yoga as it deals with the whole child: mind, body, heart and spirit. It is a form of holistic education, which helps the child in the harmonious development of one’s body and emotional and mental skills for a healthy, integrated and happy human (5). The yoga postures, also known as psychomotor exercises, included in the Circle of Love are practiced in a simple and smooth way, and even little kids can do them, preparing the body for an integrated development of intellect and feelings, harmonizing the secretions of the endocrine glands to balance the emotions. Besides that, these exercises contribute towards flexible joints, massage the internal organs, stimulate circulation, and channelize the nervous energy of children, making them calmer and focused, even those considered hyperactive . Another important aspect of the Circle of Love is meditation. When practiced regularly, it activates new areas of the brain, helping to build the basis of mental focus and spiritual sensitivity. The meditation may offer new opportunities for development of hyperactive children or those with learning disabilities, as well as in children with average mental level or mentally gifted . Among many benefits, meditation helps children to be more kind and loving and increases self-confidence, inner peace and happiness. It is a science of mind that helps not only the development of spirituality but also intellectual and social development. A practice that leads children to control the restlessness of the mind and focuses the attention should be encouraged starting in the earliest school years, thus creating a human being with less stress. Thus, the child can develop the wisdom of selfless love and compassion to bring harmony in all aspects of life, removing every barrier that separates people from each other and uniting the human society as a world family. Given the current situation of children and adolescents (hyperactivity, drugs, depression, violence, etc.) and the probable effectiveness of the Circle of Love in restoring emotional balance and strengthening affective ties, this study aimed to add the practice of “Circle of Love” in the daily activities of the Municipal Center for Early Childhood Education “Agua Viva” – Pontal do Parana, Brazil, in order to evaluate its influence on emotional, cognitive, psychic and social development of children 2 to 4 years. The ultimate goal was to prove that a more loving and humanist education, with activities that focus on love, compassion, respect and spirituality, and with exercises that stimulate the control of emotions (yoga), would be an excellent antidote to the challenges of the current society. The Circle of Love was performed in the early childhood education center every morning during about 60 school days (sep 26th, 2010 to dec 20th, 2010). It was the first activity of the day, after breakfast, and it lasted around 30 minutes. In this case, the Circle of Love was conducted with children from 2 to 4 years, 36 students in total, accompanied by the teachers. The activates of the Circle usually followed a logical order of songs. Strating with the most active and exciting music, the intensity was gradually lowered, leading up to a time of silence with a guided visualization. The children sang and followed movements while sitting in a circle on the floor, where everyone could see each other. Some songs were done standing with stretching. The children periodically practiced yoga postures along with the stories that they helped to create. There were also puppet shows, theater and circle dances; everything always dealing with educational topics that were loving, encouraging respect and compassion for oneself, with others and for animals and plants. Besides that, the practice incorporated collective massages and relaxation. After 30 school days of application of the Circle of Love, questionnaires were distributed to the teachers in order to evaluate any possible behavioral changes of the students with the practices. And the same questionnaires were redone at the end of the project (60 school days after the beginning). Each teacher answered an individual questionnaire for each student of her group. The questionnaires were composed of closed questions grouped into four aspects: Affective, Cognitive, Psycho and Social. For each question, the teachers answered if the child has regressed, not changed, improved or improved a lot in that regard. The questionnaires that were completed 30 days after the beginning of the Circle of Love were compared with those answered at the end of the project (60 days after), observing the progress of children during ongoing activities. After 30 days of activities, it was possible to perceive an improvement in children’s behavior. 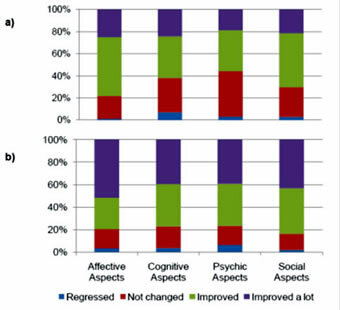 As shown in Graphic 1, about 44% improved and 22% improved a lot, averaging between all aspects. After 60 days, one can observe an even greater improvement, with 36% of children improved and 44% improved a lot. Cases of regression were minimal and can be caused by external factors, since it is difficult for the teacher to evaluate the family situation and the type of education that children receive at home. It is also evident, the increment of improvement with the continuation of the project. It is likely that the practice of the Circle of Love throughout the whole school year will bring even more positive effects at school, obtaining better results even with the more “difficult” kids. As mentioned earlier, questions were grouped by the following behavioral aspects: affective (kindness, loving, giving and receiving affection), cognitive (concentration, animus, creativity); psycho (aggression, annoyance, joy, expression, fear, shyness) and social (respect, cooperation, participation, interaction). 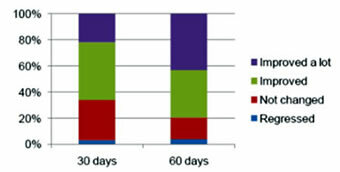 of behavior – a) 30 days, b) 60 days. Graphic 2 illustrates the effectiveness of the Circle of Love in early childhood education in all aspects analyzed in this research, with more than 50% of improvement and / or lot of improvement in all cases. However the affective and social aspects were those where the children most progressed, as in the evaluation of the questionnaires as in the observations of the researchers and educators. Given these results, it is worth emphasizing the importance of affection and the encouragement of positive emotions in the school environment, making the ideals of the Circle of Love indispensable in early childhood education. Negative emotions have a considerable influence over the whole of our intellectual and cognitive functions, and the best way to manage these emotions is by increasing positive emotions . Thus, in an affective, happy and safe environment, the students become calm and secure, build a positive self-image, participate effectively in the proposed activities and fulfill the educational objectives. Moreover, when aggressive attitudes in children are eased and interpersonal relationships are favored, then the children become benevolent with all beings that surround them. Another form of contribution of the Circle of Love is the practices of meditation, relaxation and yoga. Such activities have a positive impact on the emotional state of students and also on feelings of belonging to the One. Briefly, this project was really a proof that the Circle of Love is an important tool for the educational system fostering more humane, happier and healthier children who have a feeling of unity and equality with all beings (Neo-humanism), consequently contributing to a better world! STUMM, B. D. R.; VANTI, E. S. O desenvolvimento emocional de crianças de dois e três anos: um estudo numa turma de educação infantil. Congresso de Iniciação Científica. Universidade Federal de Pelotas, Pelotas, Brazil. 2009. ANANDA MARGA. Neo-humanistic Education: education for a new world. [S.I. ], [200-?]. ANDREWS, Suzan. Circle of Love: to open the heart. Porangaba, Brazil: Instituto Visão Futuro, 2006. REGINATTO, Rosana (Comp.). Apostila do curso de yoga para crianças. 2006. 84 f.
 ROZMAN, Deborah. Meditation for Children: Pathways to Happiness, Harmony, Creativity & Fun for the Family. Second Edition. [S.I]: Aslan Publishing, 1989. CHABOT, Daniel; CHABOT, Michael. Emotional Pedagogy: to feel in order to learn – incorporating emotional intelligence in your teaching strategies. Victoria, Canada: Trafford Publishing, 2004.